Granite countertops are sleek and sophisticated work surfaces that can add extra value to a home and also provide the kitchen space with durability and enhanced functionality. However, there are plenty of homeowners who do not want to pay the high price usually involved by thicker granite slabs. This is the main reason why they are constantly looking for cheaper alternatives to have granite countertops at reduced costs. These alternative options include the so-called modular granite counter tops as these are ideal for every homeowner who wants to have all the benefits provided by granite counter tops, but at lower costs. Modular granite is made from 100% granite but its pieces are custom cut in order to go around kitchen sinks. Also, they can be inserted just like standard cutting boards. Just as any granite countertop, a modular granite top is stain resistant, scratch resistant and it also withstands higher temperatures. 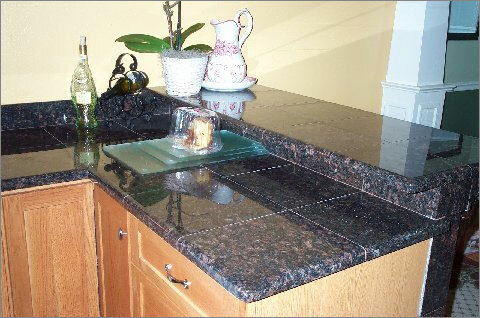 Modular granite countertops come in a wide range of sizes and color options. Modular granite can be regarded as a feature that can be easily added and simple to install as well. As it doesn’t absorb moisture, a modular granite counter top is easy to clean and it’s a great choice for a kitchen space with numerous windows as its original color is not likely to fade due to a prolonged exposure to sunlight. Simply put, a modular granite countertop is similar to a traditional granite counter top but without the higher costs of the later. So, here are the main benefits provided by modular countertops: they are much more affordable when compared to granite tiles or slabs. Additionally, modular granite is as strong as any other materials made of granite, long lasting, durable and hard. For instance, your modular granite countertop is designed to withstand extreme heat coming from hot pans and pots. Additionally, you can use this surface as a chopping board. Modular granite countertops are easy to install – you can have your own modular granite top cut in order to fit your kitchen cabinets perfectly according to their sizes and shapes. So, you will not have to hire a professional to do this job – instead, you can install your modular granite countertop just by yourself. Keep in mind that a modular granite kitchen top may be cheaper when compared to other kitchen countertops, but this does not mean that you will get less quality from it.